T ektites are still poorly understood. They are irregularly – and at times elaborately – shaped nodules and blobs of a glassy substance. They have no crystal structure and are therefore similar to obsidian, but are not associated with volcanic processes. Their chemistry is unique and unexplained. The leading theory concerning their origin is the “Meteorite Impact Theory”. It is postulated that many odd events occur during a meteor’s impact, because of the tremendous heat and pressure produced. Tektites may be fused glass that formed during an impact of a meteor with layers of rock on the earth’s surface. Tektites occur in broad bands in specific localities in different parts of the world. These bands produce characteristically similar tektites and are sometimes loosely associated with meteorite craters or suspected craters. Could these fields represent splash material from an impact? Many believe so and this idea is gaining acceptance from many scientists. The odd and diverse chemistry of the tektites could be a result of unique meteorites hitting unique rock types with the combinations producing particular effects. Tektites, which have been found on every continent, are tar black or blackish brown, while moldavites, which have been found only in the Moldau river valley in Czech Republic, are a deep green colour. The only known fall of moldavites occurred about 15 million years ago. Humans prized them at least as long as 25,000 years ago, for archaeologists have discovered moldavite shards and pieces in cave dwellings of that era. Moldavites are the rarest of gems, perhaps rarer than diamonds, rubies or emeralds. Since their origin is not of the earth, the discovery of new deposits seems unlikely. Moldavites are sometimes cut as gemstones or put into jewellery as natural uncut pieces to show off their often eerie and exquisite intricate shapes. Although moldavite has been known of as a gem for thousands of years, it remained in obscurity until recently, the only reference being an article in the Lapidary Journal in 1958 about a strange stone with some kind of mystical properties. In 1986 the wonderful book ‘Moldavite, Starborn Stone’, by Bob Simmons and Kathy Warner, was published. It brought the truly transformational stone moldavite to the attention of millions of ‘Light-Workers’ around the Planet. Basically, moldavite has no structure; this means it can take you beyond your self- limiting belief system into uncharted realms of infinite possibilities. 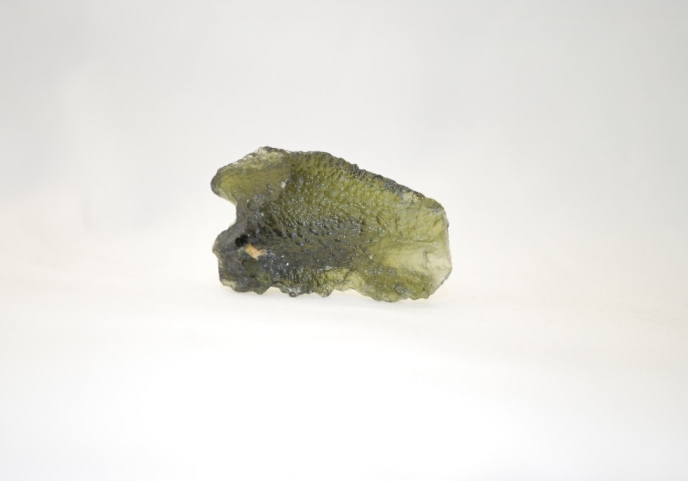 Moldavite contains the essence of shunyata, the vast emptiness (which contains all potentiality),stretching in all directions, absolutely clear, pristine and radiant. By this clear starry night sky stretching into infinity we can gain an understanding, a feeling for the expansiveness and freedom which could be ours if we did not allow our horizons to become narrow, clouded and limited, if we did not permit our minds to become fixated and hypnotized by cravings and worries centred on what really are empty passing phenomena. Moldavite’s chemistry is unique and unexplained. The leading theory concerning their origin is the “Meteorite Impact Theory”. They were born from a meteor’s impact because of the tremendous heat and pressure produced. This makes the energy of moldavite very fast, hot and cosmic. They were sent here for the awakened ‘star children’, to help their ascension into the higher realms of cosmic consciousness. This massive vibrational shift is happening right now, that is why so many people feel a magnetic attraction to the cosmic transformational tool of moldavite. Green is a balance colour, it is the bridge, a gateway into the heart of the body; the lesson of love that needs to be learned in order to grow spiritually. Green will encourage your spiritual growth. It wants you to take your proper place in life. Green gives you harmony and balance. Green does just not follow rules blindly; it creates better ones where the old ones have failed. Green holds the keys to memory – it can remember that which needs to be remembered. So it unlocks the deep and hidden that is the cause of our psychological and physical dis-ease. It is the diagnostic colour. This makes moldavite one of the best diagnostic crystals we have available. An aversion to moldavite or the colour green often indicates that we do not feel at ease with our emotions. It shows a deep fear of opening our heart chakra fully to unlimited unconditional love. Metaphysically, we have within us the light body and this contains encodements of information like tiles. When we hold moldavite this data is released. Very often many people are not consciously aware of the information being unlocked, they just feel what has commonly been called the moldavite flush’, a huge wave of powerful energy which actually flushes through the body. This can cause sweating or a bright ‘red’ face. Interestingly, red is the green ray’s balance colour. Others experience the decoding or download as heat surging up their spine. Still others experience the download as an emotional release of tears or laughter. Others find the vibrational download shift and the resulting rise in their vibrational rate as too intense; they may become fearful. Others experience it as dizziness or headaches. There is no doubt, though; the download does cause massive spiritual growth. It can take years to fully integrate the download of information. In fact the more people resist the integrationof their Divine blueprint being decoded from the Akashic records, the longer it takes. When we hold, wear, meditate or carry moldavite our energy field changes. The universal law of resonance says that what we focus on becomes our reality. Like attracts like. When we understand that every thought is sent out and attracts like energy which strengthens it, then comes back to us like a boomerang, we begin to grasp how the higher vibration of moldavite increases our sensitivity and increases our clairaudience and clairvoyance abilities. We literally attract a higher form of guidance. Moldavite does have an Oversoul Spirit Guide, which is a vast cosmic Angel. The moldavite Angel can help in all areas, including connecting you to other high vibrational guides and Ascended Masters. These Cosmic Masters have been around for aeons and are able to work with anyone whose vibration has been raised sufficiently. You don’t have to use moldavite, though, to attract Cosmic Masters. Many people who have refined their vibration through meditation have accessed this guidance. The ‘Grail Stone’ is another name for moldavite: it is its ‘Spirit’ name. Legend has it that anyone who touches the ‘Grail Stone’ will have a spiritual transformation. Those who choose to wear, carry, meditate or heal with moldavite carry the energy of moldavite within their Divine blueprint. This makes them the ambassadors for transformation; indeed their energy is raised to such a high vibration of resonance they become the instruments of the enfoldment of the Divine plan for Planet Earth as she and her children make the vibrational shift into the next dimension. Variates to the numbers 2 and 6. Astrological Sign of All, Scorpio predominant.